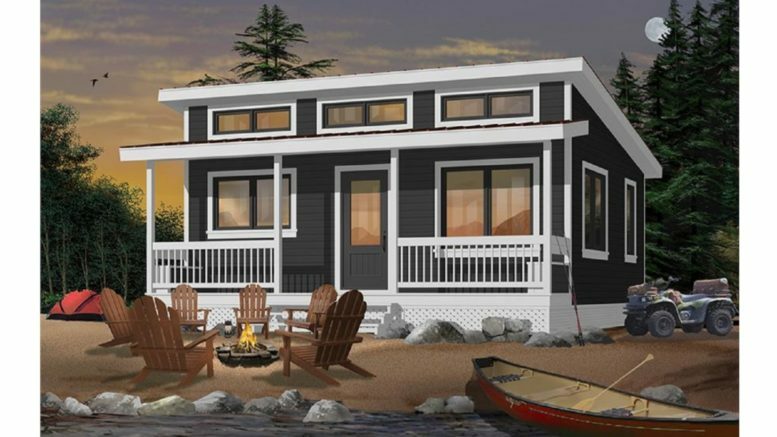 480-square-foot house plan. Image courtesy of The Plan Collection. When it comes to tiny homes, the appeal is real … still. The tiny house movement in the United States is still going strong, about a decade after it firmly settled into America’s cultural, social, economic, and architectural landscape. Tiny homes grew in popularity, particularly among people who could no longer afford their home mortgages or wanted to downsize and save money but were not interested in apartments or other rentals. Back then, some pundits predicted that the trend would wane. But oh, how wrong they were: The tiny-home trend has had continuous growth since 2007. So, when is a home “tiny” — or just “small”? While there are no official size guidelines, houses that are between 100 and 500 or 600 square feet are generally considered tiny. Often, tiny homes are meant to be mobile — and are constructed on either a trailer platform or a frame with wheels. But there are tiny homes built on foundations, like any other house. There are many reasons people choose tiny homes. Among the more frequently cited reasons are affordability and sustainability of a small structure. More specifically, some people have said tiny homes offer financial freedom from mortgages and debt, allowing them to spend their money on other things such as travel or a retirement fund. Other popular reasons cited include lower personal impact on the environment, lower heating and cooling costs/energy efficiency, and a desire to live a minimalist lifestyle — a life of less materialism and less item accumulation. Karen Vanessa Gonzalez, a 45-year-old Arizona resident, wants to own a tiny home in the not-too-distant future. She points to financial freedom, a reduction of her eco footprint on earth, and a desire to play catch-up with her retirement saving as her reasons for the lifestyle shift. But having a tiny home someday means so much more than that to her, she said. Tim Bakke of The Plan Collection, a company providing more than 20,000 house plans from leading designers and architects, echoes Gonzalez’s statement about the ease of mobility of tiny houses for those who want to travel around the state or country. Looking to downsize but not looking to downgrade on residential luxury or opulence? There’s even a tiny house format for that. With the savings from building a micro-home, some homeowners can afford to spend some extra cash on high-end materials and furnishings — expenses that can still be bargains because not as many material and furnishings are needed to fill the small spaces. There are some things to keep in mind when thinking about tiny home living. The cost of building a tiny house, depending on variables such as the quality of the building materials, generally can range from around $1,000 to $100,000. But that doesn’t include the cost of acquiring land. Then there’s another challenge. Most local zoning laws, regulations, and building codes across the United States usually have a minimum square-footage requirement for newly built homes. That requirement usually exceeds the square footage of a tiny house. Even with those challenges, the growing intrigue and popularity of these super-small homes, especially the luxury-accented ones, have already been the subject of reality television programming, info-tainment home shows, magazines, and social media. The tiny house movement has also moved into the minds of many community leaders and housing specialists scraping for an answer to homelessness in various locations across the nation. For example, in the greater Chicago area, two local aldermen said they are considering whether tiny homes could house the nearly 6,000 people who are homeless in and around Chicago, CBS Chicago news reported recently. Portland, Ore., and Racine, Wis., have also explored the potential for tiny houses easing homelessness issues in their areas. The tiny house movement has even started taking hold in the commercial and travel industries. One example is Caravan, a tiny-house hotel in the Alberta Arts District in Portland, Ore. Caravan’s custom-made tiny houses on wheels range in size from 120 to 170 square feet. In addition to being a unique hotel stay choice, a hotel like this is a way for people to see what life is like living in such a small space. “All of our tiny houses have flush toilets, hot showers, electric heat, a sitting area, a kitchen and lots of locally made art and sustainable, Fair Trade products,” Caravan’s website states. “Giving a tiny home a test run by staying at a tiny home hotel is not a bad idea,” Bakke said.